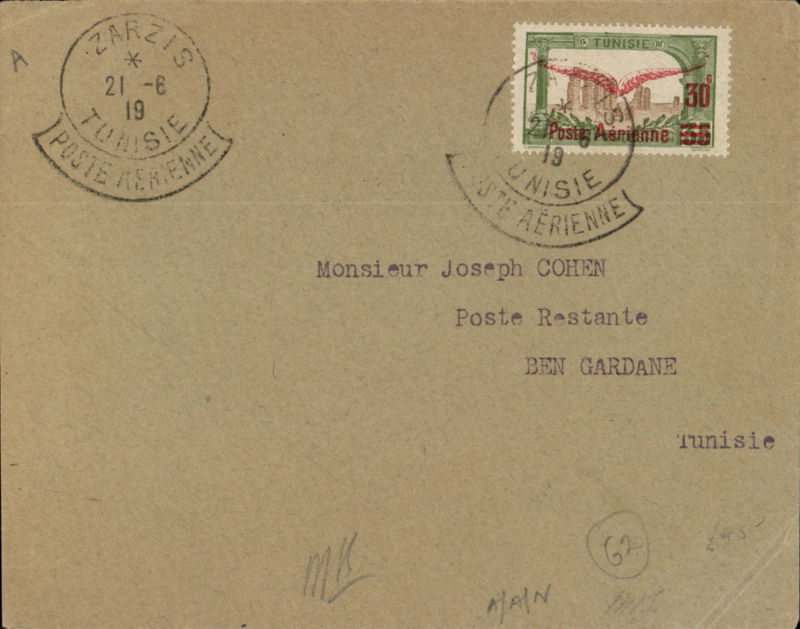 F/F Zarzis to Ben Gardane, bs 22/6, plain cover franked 35g opt 30g/Post Aerienne with wings, canc 'Zarzis/21.6.19/Tunisie/Poste Aerienne'. 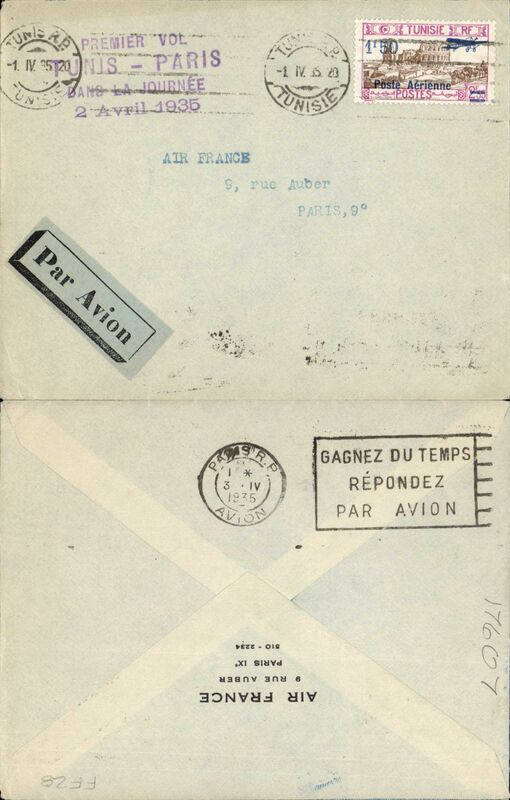 Air Union/Air France, early airmail cover to Paris, no arrival ds, franked 1927 air set of 4 values (issues for use on the Tunis-Antibes Line), canc 'Sfax/6 XII 27' cds. Sfax is 130 miles SE Tunis. Uncommon origin and early flight on the Air Union Tunis-Antibes service. Aerophilatelic Expo, Tunis to Marseilles,, bs, attractive blue/white/purple souvenir card, franked 1F50, large violet circular Expo cachet, green/white Expo vignette, light blue/black airmail etiquette. Attractive item. 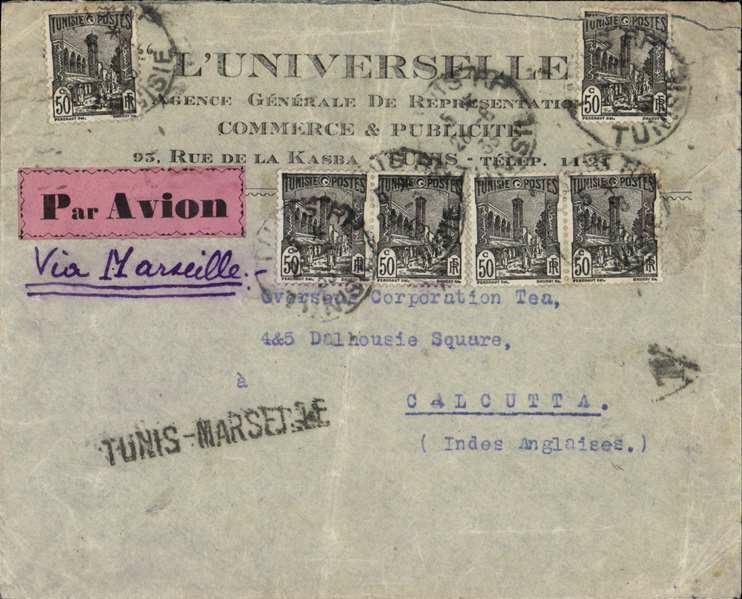 Tunis to Calcutta, printed commercial cover franked 250c, via Marseilles28/3, uncmmon pink/black airmail etiquette, black straigh line 'Tunis-Marseille' Jusqu'a. 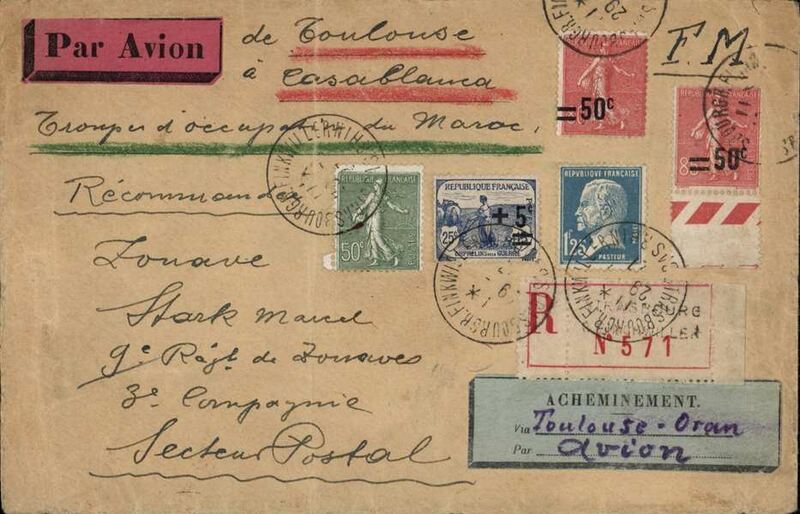 Aeropostale, Strasbourg to Casablanca, via Marseilles 28/6, cover to member of occupation troops in Morocco, registered (label) cover 'FM'+ registrationn fee 1F50 +air mail surcharge1F50, nice copy of blue/black directional label "Acheminement/Via (ms) 'Toulouse-Oran'/Par (ms) Avion. 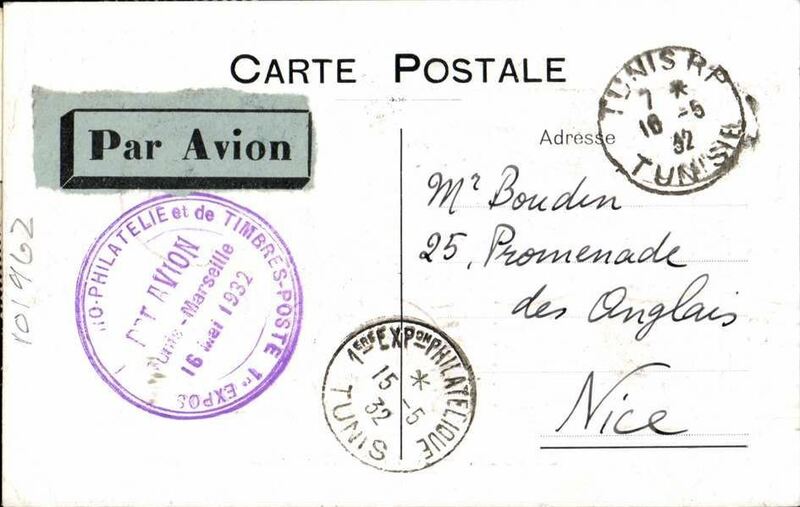 First direct flight Tunis to Paris, bs, via Ajaccio, franked 1F50 canc Tunis pmk tying pale blue/black airmail etiquette, violet two line and blue four line flight cachets. 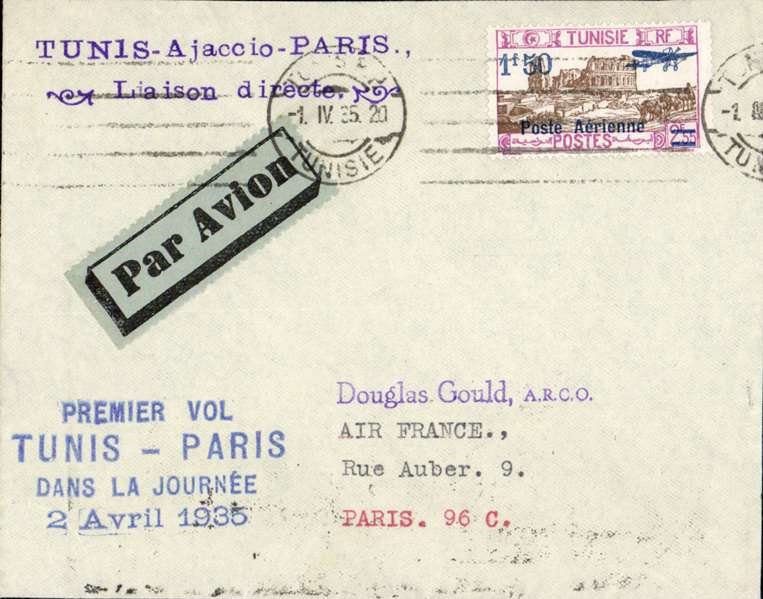 F/F of same day service, Tunis to Paris, bs 3/4, plain cover franked Scarce Scott C12, postmarked Tunis April 1, 1935, special violet four line cachet for this flight, black/grey blue airmail etiquette. The pilot Ringel left Tunis on April 2nd at 8am and arrived in Marseille at 5:17 PM. 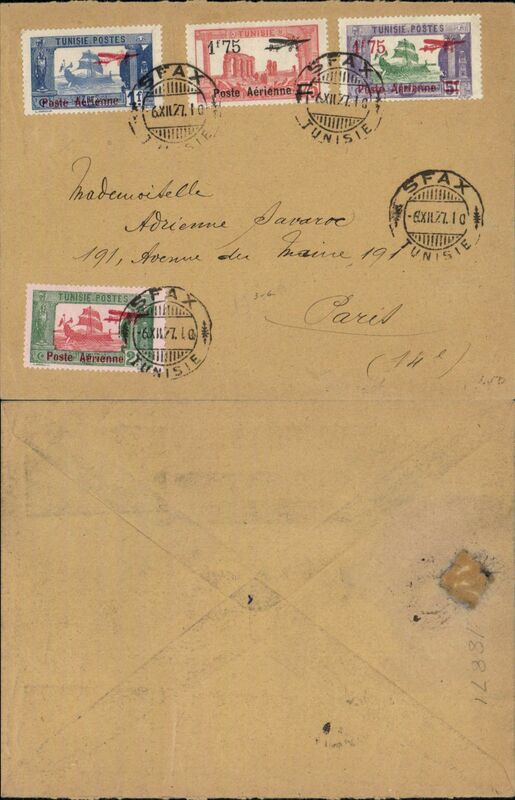 The mail was transferred to the Marseille-Paris plane at 5:35pm, see Truc 'Poste Aיrienne Franחaise', vol.1 Afrique du Nord, p118 no.16. 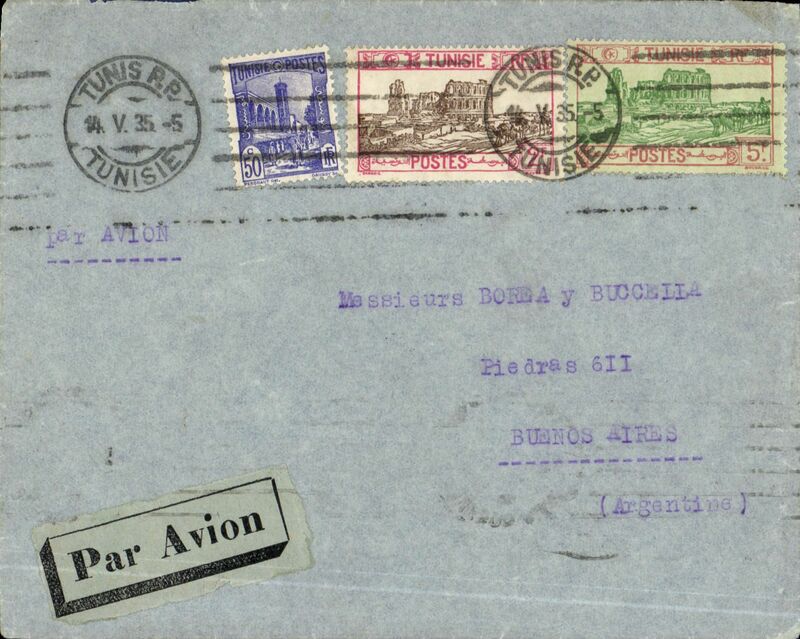 Tunisia to Argentina, cover postmarked Tunis May 14, 1935 to Buenos Aires with arrival b/s May 26. Advertising sticker on back. Black on blue airmail sticker. Franking of 7,50 Frs. Uncommon. 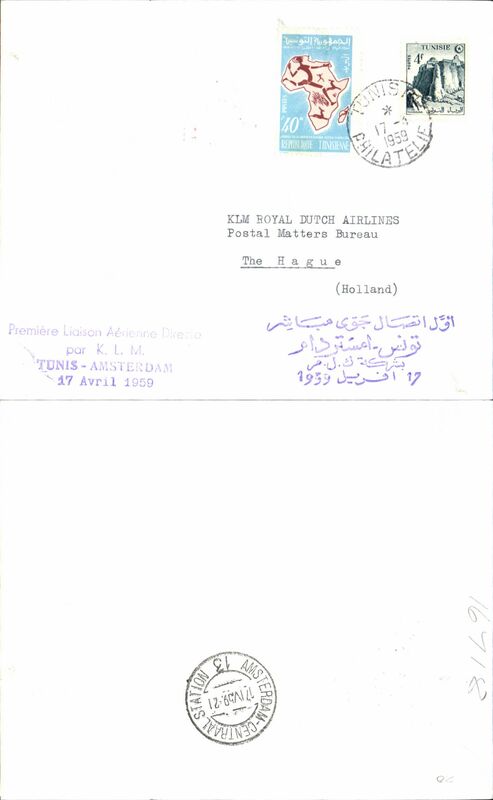 KLM F/F Tunis to Amsterdam, bs 6/11, plain cover franked 4F 40m, violet four line flight cachet in arabic text.